Prefabricated & Custom Built Outdoor Bus & Prefab Smokers Shelters & Sheds - Material Handling Equipment Product Information - Prefabricated & Custom Built Outdoor Bus Stop Shelters With Solar Options. This 5' x 10' 3 Wall construction Prefabricated Outdoor Shelter can easily be used as a Bus Shelter, Smoking Shelter or just simply a People Shelter. This Aluminum Bus Stop Shelter is made of a Dark Bronze Anodized Aluminum Structure with ¼” Clear Tempered Safety Glass. Comes with a white Acrylic Dome Roof with Fascia and Integral Gutter as well as a ADA Compliant Aluminum Bench with Backrest. Installation Instructions and Hardware are Included. Installation is Not Included with this Bus Stop Shelter. The Outdoor Shelter must be anchored into 4” concrete (consult local building codes for more details). Off loading the shelter is the responsibility of the customer. A Forklift with extensions may be necessary to take delivery of this unit. These shelters are shipped knocked down in prefabricated wall sections and roof modules. The Shelter is designed to withstand minimum vertical and horizontal windload of 20 PSF. Roof shall be designed to withstand minimum deadload of 40 PSF. The Prefab Shelter can be outfitted with optional lighting, including solar, heating, schedule holders, bench seating, commercial doors, grill work, sign age, etc. 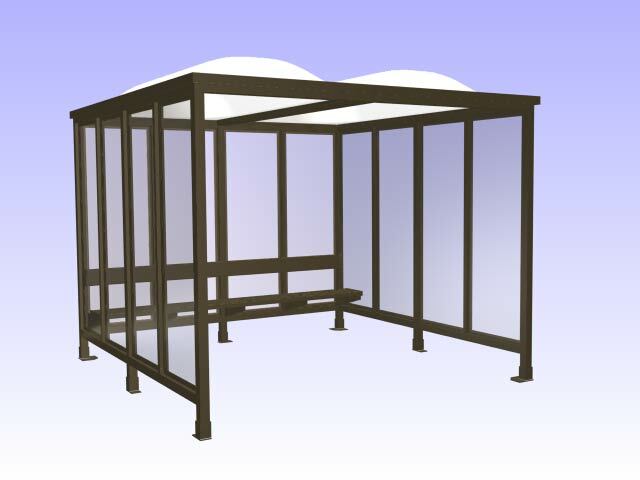 Please call us at 1-888-776-3720 for more details on custom built shelters.